I figured some of you could use some pink gummies this week. Yes! Homemade gummies you make yourself! I can hear you eye-rolling, but it’s about as easy as making a batch of Jell-O. Bonus: you get to use wine, even more than they use in those fancy champagne gummies that cost $20 per quarter pound. Rosé has good colour and flavour, but these work with white or red too—a great way to use up the last cup in a bottle (it can happen! ), or some prosecco that has gone flat. And if you don’t want to use wine at all, you can swap in your juice of choice – cherry is delicious. Apologies for the lone photo, but I’m realizing that a short and sweet recipe share is better than none at all. Amiright? This batch makes a lot, but they will go fast, especially if you bring them to the office. It’s easier to commit to a teeny bite of pink jelly, unlike a cookie or cupcake, which I find most people hesitate over. And they keep well, so if there are any leftovers you don’t have to worry about storing them properly or freezing them, they’ll just hang out on your countertop to nibble for as long as they last. 1In a medium saucepan, stir together the rosé and sugar and sprinkle the gelatine overtop; let stand for a few minutes to soften. Set over medium high heat and bring to a simmer, stirring until the sugar and gelatine are dissolved. Stir in a drop of food colouring if it’s not quite pink enough. 2Pour into a loaf pan (or small silicone candy moulds, if you have them) and refrigerate until firm. 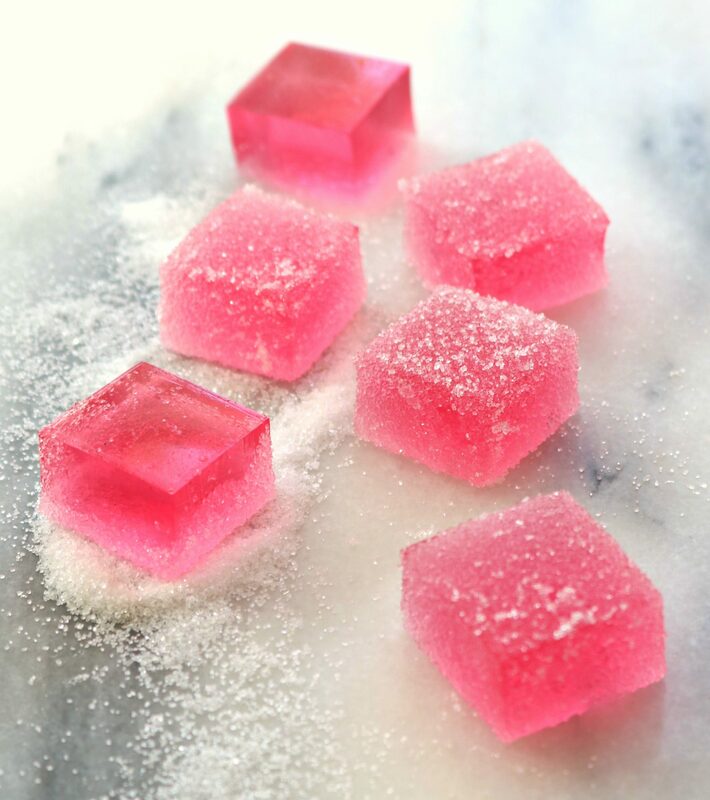 Cut into small 1/2-inch cubes and roll in a shallow dish of sugar to coat. Makes about 60 gummies. Hi Julie, My son saw these and would love to take them to school for Valentines day. Which means I need to make them without the rose! 🙂 What would be the measurements if I am using a juice? Same quantities of liquid to gelatin! My has set in a pan. Any suggestions on the best way to get them out without ruining the bottom? I can’t remember the last time I made Jello! Use a really thin metal spatula! Sometimes they suction themselves in there too! I had just enough Chocolate Cherry Wine (a gift from a friend who makes wine kits) left to make a batch of these. Gorgeous colour- deep dark cherry – and delightful taste. Makes a lovely gift! 2 packages? What does that translate to in grams or volume?